So I decided the chair needed to be red…. This is the most raw form of the painting after the line drawing, which took twice as long as I expected! The perspective had to be corrected, the light and shadow lines simplified (some of which cannot be seen at this size – the finished piece will be 16×20). In line form, it looked so wrong. And yet once I got some of the paint down, it seems to be working. The complexity forced me to leave the non-architectural shadows to a minimum. I didn’t want to confuse myself when I can eyeball it more easily in the paint stage. This is lit at an extreme angle, and largely from another window. With every painting, there is music to accompany it. The song for this painting is rather poignant and inspiring. It’s tone is slightly sad and yet moving and expansive. Painting is a physical, emotional and spiritual experience for me. Music can help bring me back to the mood of the place I am painting and help me to recall the feeling of a location and where I was emotionally at the time. I thought I would share a video of a live performance with you here. When the painting is finished, hopefully in a little more than a week, you will see what I mean. Enjoy Civil Twilight ~ “Human”. What a lovely and sensitive mood towards your subject. You can tell you pour your heart and soul into your work–definitely filled with emotion. Great solid start–I know it will be beautiful when completed! Enjoy! Oh my! 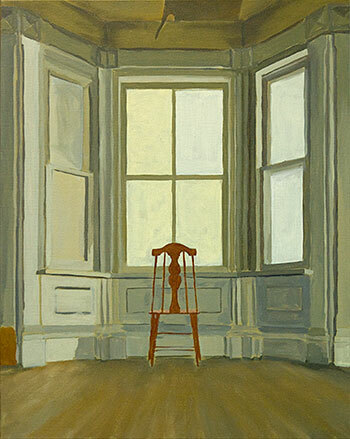 I absolutely love your room and chair paintings just lovely! The painting looks lovely so far. I can see how it would look odd before you got some paint down, but rest assured, it looks like it’s going to be really cool!